On August 9, 2014, Michael Brown, an unarmed African American high school senior, was shot by Officer Darren Wilson in Ferguson, Missouri. For months afterward, protestors took to the streets demanding justice, testifying to the racist and exploitative police department and court system, and connecting the shooting of Brown with the deaths of Trayvon Martin, Eric Garner, and other young black men at the hands of police across the country. In the wake of these protests, the Department of Justice launched a six-month investigation, resulting in a report that Colorlines characterizes as "so caustic it reads like an Onion article" and laying bare what the Huffington Post calls "a totalizing police regime beyond any of Kafka's ghastliest nightmares." Among the report's findings are that the Ferguson Police Department "Engages in a Pattern of Unconstitutional Stops and Arrests in Violation of the Fourth Amendment," "Detain s] People Without Reasonable Suspicion and Arrest s] People Without Probable Cause," "Engages in a Pattern of First Amendment Violations," "Engages in a Pattern of Excessive Force," and "Erode s] Community Trust, Especially Among Ferguson's African-American Residents." 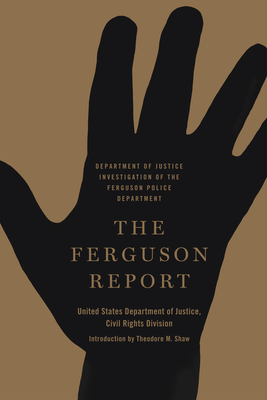 Contextualized here in a substantial introduction by renowned legal scholar and former NAACP Legal Defense and Educational Fund president Theodore M. Shaw, The Ferguson Report is a sad, sobering, and important document, providing a snapshot of American law enforcement at the start of the twenty-first century, with resonance far beyond one small town in Missouri. Theodore M. Shaw, former president of the NAACP Legal Defense and Educational Fund, is the Julius L. Chambers Distinguished Professor of Law and Director of the Center for Civil Rights at the University of North Carolina School of Law at Chapel Hill, where he lives.